Monday-Friday | 9 a.m. - 6:30 p.m.
Sunday | 9 a.m. - 5 p.m. 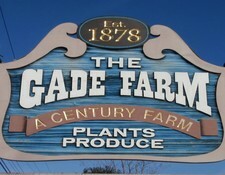 The Gade Farm has been in continuous operation since 1878. We strive to provide quality, friendly service and have knowledgeable employees that are happy to assist you. We're also happy to help you load your car, whether it is plants or soil in the Spring or straw or corn stalks in the Fall. We offer custom plantings in the Spring and Summer- just bring us your pots (or choose on of ours) and we will plant it for you! We also do custom decorating for the Fall and Winter for your wreaths, centerpieces, boxwood trees, etc. Most people don't realize that we grow the majority of our plants right here in our own greenhouses- not shipped in from other places. Most of our annual packs are grown from seed, requiring transplant from the seed tray to the flat. All of this is done by hand! The plants that you see in our store in May started out in our seed house in February!! We have fields of fresh vegetables growing on our land (located behind the main store and greenhouses). We grow our own corn, tomatoes, lettuce, broccoli, peppers, squash, eggplant, herbs, and flowers (to name a few).